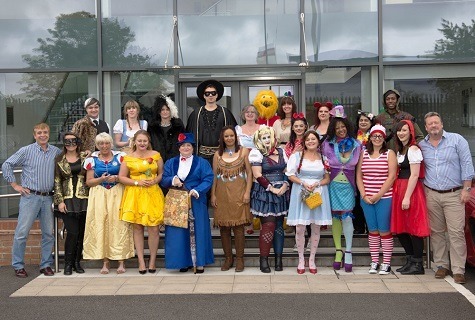 On Friday 11 August, Midshire staff arrived at work dressed head to toe as Disney and fairy tale characters, for its annual charity day, raising over £1,100 pounds for Shropshire-based Severn Hospice. Now in its third year, the Midshire Midlands office invited all staff to nominate a small charity close to their heart. Out of the 50 charities nominated Severn Hospice was selected at random by Midshire’s managing director, Phil Powell. Established in 1989, the Severn Hospice gives free specialist care and support to families across Shropshire and Wales who are living with terminal illnesses. This care is only possible because of the support they receive from fundraising activities throughout the local community. Organised by customer service manager Joanne Palmer and senior customer service administrator Billie-Jo Adams, staff from all departments across the business took the opportunity to dress up for the day as their favorite Disney character. As well as the amazing costume competition, there was a huge raffle, with prizes donated by Midshire staff and its business partners. Over 65 prizes were donated, including: £250 worth of vouchers, Beats Headphones, an Amazon Echo, champagne, perfume and even a day off work! The event was a huge success, and a final count revealed that Midshire raised £1,1153.83 for Severn Hospice.